Welcome to the Young Astronomers Program! 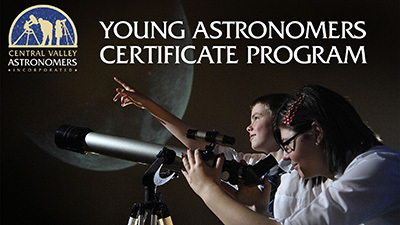 What is the Young Astronomers Program? The CVA Young Astronomers Program is a program designed to help a student go from an interest in astronomy to being an active amateur astronomer. The program encompasses many facets of amateur astronomy and takes a full year to complete. Students are paired up with one or more mentors that will teach them the skills and guide them through the program. Students that successfully complete the program will earn their very own Dobsonian telescope, purchased by the club for them at no cost. CVA Young Astronomers Program students must be between the ages of 13 and 23 as of September 1, 2018 for the 2019 program year. Please download the Program Summary (link below) for information on the competencies (skills) that students will learn, the requirements for applying, and the expectations that must be met in order to complete the program.